Mano a Mano (One Hand at a Time) is quickly becoming one of Cuba's hottest new vocal groups. Five virtuosic voices united in complex harmonies set against innovative rhythms rendering fresh interpretations of Cuban classics, dynamic new compositions and unique covers of pop songs. Mano a Mano (M2) is comprised of Arian Ferrer-Castro, Carlos Raul Torres, Orlando Cartier-Sanchez, Miguel Angel Herrera and Yorlan Arencibia, under the musical direction of Ernesto Lima Parets. These classically trained singer-musicians hailing from various provinces of Cuba are being referred to as a cross between Take 6 and Pentatonix. With a repertoire ranging from American spiritual a cappella arrangements to fully orchestrated ballads and latin music, M2 is redefining the boundaries of what a “chorus” can be. Since the group's debut in May 2014 (as Grupo Vocal Antinoo) they have performed at many venues in Havana and had the distinction of opening the Cenesex Gala 2015 at Karl Marx Theater. Most recently they had the honor of representing Cuba's LGBT community by jointly performing with Gay Men's Chorus of Washington at Instituto Cubano de Amistad con Los Pueblos (Cuban Institute of Friendship with the Peoples) during GMCW's visit to Cuba -- the first cultural/diplomatic exchange of this type between the Cuba and the United States. They are currently traveling in the United States during the spring and summer of 2016 for their first People-to-People cultural tour, including GALA Choruses' Festival 2016 Denver. 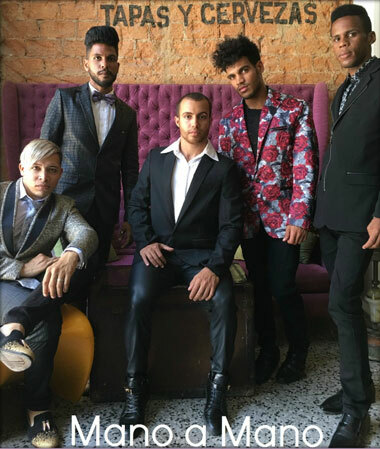 The first openly gay musical group in Cuba, M2 released their first EP, "Mano a Mano, Volume 1-First Hand" , February 2016 under the direction of Grammy Award winning producer Andres Levin. Under the artistic direction of the group's creator Fermin Rojas, a Cubano man raised in the United States, Mano a Mano's vision is to unite hearts and erase barriers of discrimination through the language of music. Vist our Facebook Page to learn more. View our videos on Facebook. "We've had a blast performing with GALA Choruses. We are moving on with our tour of the US to spread our message of LGBT equality and renewed relations between our countries."